Finally technology is coming close to what I had been dreaming in interface design. Interface being the part of the machine you touch and see. Such as a number keypad on phone, the keyboard/mouse on a desktop personal computer, the joystick/gamepad for video game devices, the touch screen on some Automatic Teller Machines (ATM). 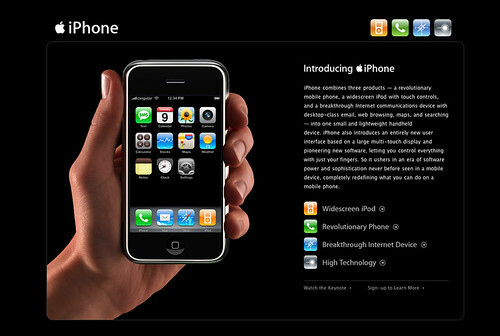 A lot of you by now would have seen Apple CEO, Steve Job's keynote address introducing the iPhone (see previous post). It's an impressive concept and will hopefully serve to shake up the 'Yaaawn' sleepy mobile phone industry - that have been launching very boring devices. However I don't swallow Apple's claim of having 'reinvented' the mobile phone. A lot of parallel impressive initiatives are also due to be launched, but have had their thunder stolen by Apple. 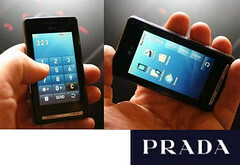 Take LG's Prada phone, which will be launched quietly this year in Europe before the iPhone. Also, waiting for adoption is Synaptics' Onyx Concept. All of the above incorporate some form of multi-touch or touch-screen technologies to allow the interface buttons and controls to change depending on the feature being used - a keypad for writing text, number keypad for the phone dialing, play/pause/stop/forward buttons for playing music or video. A full implementation of multi-touch technology can be seen in a research presentation by Jeff Han at TED in California. This goes beyond just mobile phones. The future promises foldable screens, Rollout screens, further convergence of features and devices, and more imaginative way to facilitate that convergence. Other great obstacles in adopting featured portable devices is the battery life and pervasive connectivity. A battery should last at least 48 hours with the gadget being in full use for true portability. Also, mobile connectivity to a telecom network and wireless internet is still very patchy. It is all, in a way, just getting started. Till all of these technologies become available in the marketplace in some reliable format, I'll may probably stick with my trusty Kyocera 7135. Apple finally throws its hat in the mobile phone design rink with Steve Jobs announcing the 'reinventing of the mobile phone'. The device combines the following features - multi-touch screen (without a stylus), iPod (without the click-wheel), internet browser, and phone application. By loading the Mac OS X operating system onto the device, it should be able to add further applications and capabilities. Where Apple always scores over others is in the flashy interface design. 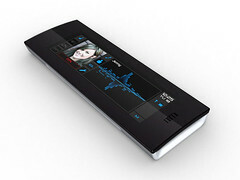 The screen displays colorful glass-design buttons and there are transition video clips on moving between applications. Scrolling graphic-design is also made to look very smooth. I've seen almost all these features somewhere else already (see next blog entry). The nice surprise for me was the browser. According to the online demo the browser renders the whole online page on the small iPhone screen and then allows the user to zoom and navigate to different areas of the page. So far, this is the best compromise between the size of web pages and small portable screens. Steve Jobs sniggered in the presentation that the iPhone doesn't need a stylus ( probably in reference to Palm devices) and you only need your fingers. I'd like to see him eating finger-food and trying to use his iPhone at the same time. Constantly sliding your fingers on the smooth screen of the iPhone is going to give it a very grubby used look. Maybe Apple can then also start selling portable iPhone cleaning kits including special cloths and solutions. iPhone is due to be released US-only in June 2007 and slowly rolled out in the rest of the world in 2008. So I wonder, what was the reason of announcing the product this early? The fact is that there are already many such designs coming out there from other players. The strategy was probably to steal everybody else's thunder. 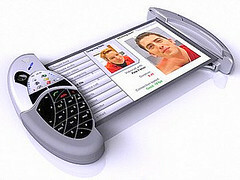 Mobile phone companies are already incorporating media players in their devices, so the iPod is under threat. I know it doesn't look that way now, but the industry can shift very quickly. Now that all the competitors know what the iPhone is about, they are going to be releasing their parallel products sooner if not simultaneously. Apple iPhone is going to be used with only the telecom provider Cingular in the US. Though they cover a lot of US they don't cover all of it. So there are online jokes going around about needing to shift homes just to get an iPhone. More iPhone humour is found at this MadTV launch of the iPhone.